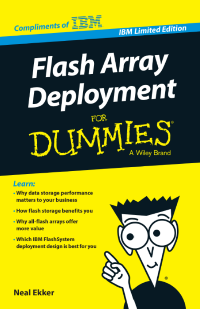 Download this eBook to be introduced to flash storage, why you may choose to solve these prob- lems with flash storage, and highlight some benefits if you do. Information technology (IT) is a means to solve problems and enhance business opportunities. In order for your company to manage and transfer data successfully, it must become faster. Flash array deployments are used most often in data center environments where multiple computers (servers) can access or share the same storage solution.